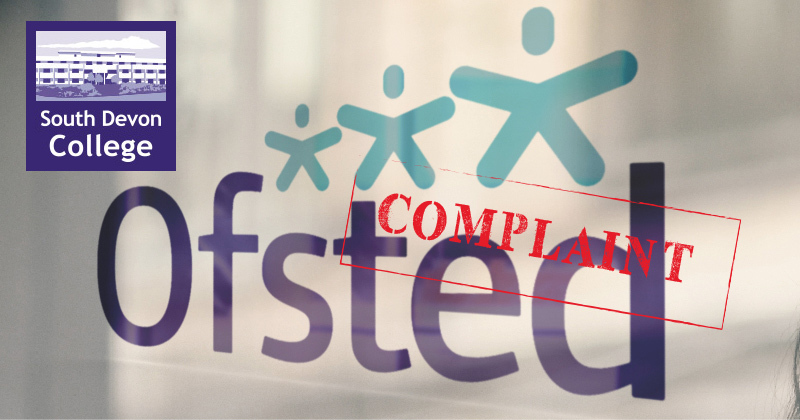 A college has complained to Ofsted about a grade three verdict on its 14-to-16 provision, which it claims failed to recognise the special challenges involved with teaching at this age. South Devon College was rated ‘requires improvement’ for this headline field in a report published last week, in which its overall grade dropped from ‘outstanding’ to ‘good’. The college confirmed today that it has complained to Ofsted. “We are extremely disappointed that Ofsted was unable to recognise the innovative curriculum that we offer, the exceptional feedback we receive from parents, and the excellent GCSE results which our pupils achieve,” they said. It added that full-time 14-to-16 provision is “highly personalised with vocational options beyond what is traditionally offered in many schools”. Examples of feedback from parents included such statements as “her confidence and grades have grown in huge amounts since joining”, “never did I imagine she could have increased her scores this much”, and “he has made fabulous progress, without a doubt the best decision ever made”. Progress 8 aims to measure how students have advanced from the end of primary school to key stage four (14 to 16). It first took effect for provider accountability in June 2016. Ofsted’s report on South Devon College warned that expectations are not always high enough for 14- to 16-year-olds. “Staff expectations of what learners can achieve in some academic subjects, including English, mathematics and science, are too low,” inspectors wrote. There were 150 full-time 14-to-16 learners at the college’s “high school” at the time of inspection, of whom 79 were in year 10 and 71 in year 11. A further 255 were part-time learners, many “electively home educated”. A spokesperson for the inspectorate would not comment directly on the complaint. Colleges have been able to teach 14- to 16-year-olds for the past four years, but relatively few do so. The Education and Skills Funding Agency only lists 19 that intend to enrol for that age from October this year. You can read more on issues surrounding how colleges deliver 14-to-16 provision in a special investigation in the upcoming edition of FE Week.